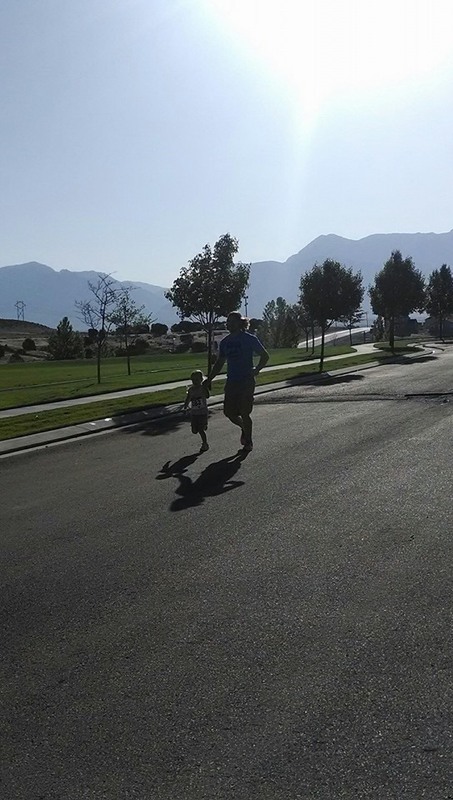 The time has finally come to be able to share my passion for running with my kids. Aside from a few little fun runs and a 5K that I ran with my oldest daughter, Aspen, the kids haven’t been too much into the running thing. For the past six years, I have been a soccer mom, dance mom, and most recently, gymnastics and diving mom. All of these things have been great and rewarding, and I have loved every minute of it. However, I don’t play soccer, I don’t dance, and aside from my self-taught flipping skills on the trampoline, and jumping off houseboats and cliffs at Lake Powell, my gymnastics and diving abilities stop there. 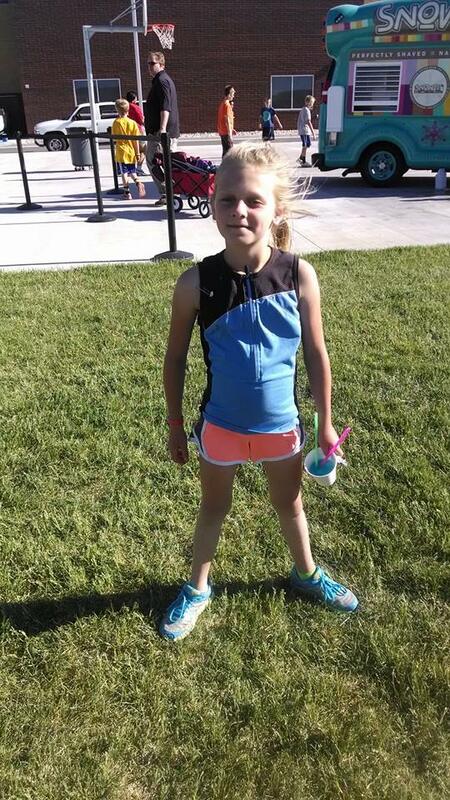 I never want to push my kids into doing something they don’t want to, and I was elated when Aspen, my 8-year-old said she wanted to run at the Hershey’s track meet. After all, this is where I began running, and where I spent much of my summers from ages 11-14 doing. I wanted so badly to be able to relate to my kids in something that has meant so much to me over the past 20 years. Knowing that Aspen has tiny legs, and hasn’t done too much by the way of running, I signed her up for the 100m and 400m. An hour before the meet, my oldest, Anderson – whose 10th birthday we were celebrating that day – decided he wanted in the fun, too. 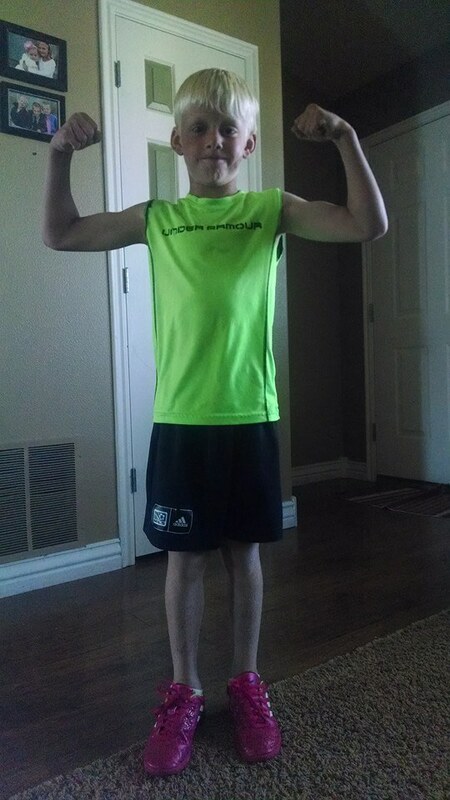 This was a big deal because he had soccer practice that day, and he wanted to bring cookies to his team. I quickly signed him up for the 100m and 50m dashes. Long story short, Aspen did very well, despite being the youngest of the youngest (an 8-year-old in a group of 9-10 year olds). Best of all, she still had a smile after. Anderson ran both races in his new Messi shoes, and ended up taking 3rd overall in the 100m and 2nd overall in the 50m, qualifying him for the district meet. It was so fun to see the two of them racing, enjoying it, and having success. 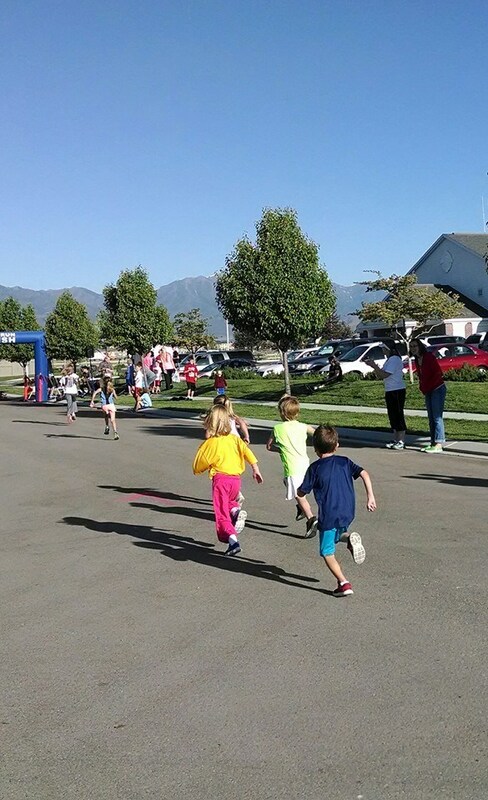 I had all of my kids with me at the meet, and after seeing how much fun it was, they all wanted me to sign them up for the kid’s race that was after the 5K I was running that weekend. Jump ahead to today: The Pony Express 5K. This is a race that is super fast. I ran it in 2012, and it’s where I got my 5K PR. Today, though, I wanted to use it more as a training run. I have a marathon in July, and needed to get a long run in with some fast miles. So, I decided to run the 3.5 miles to the start, race the 5K at about a 6:00-6:10 pace, do a cool-down while I waited for the kids’ race to start, then run the 6 miles home. Before I started my run to the start, I was worried about two things: water and my shoe (laces). I didn’t want to bring water, and risk losing a bottle or pack. Also, my Altra Intuition 1.5s are the perfect shoe, but the shoelaces come untied often. I debated whether to wear my old racers (Adidas Adizero Manas), but with the amount of slower miles I was putting in, I was a little worried about the cushion. I had the thought to change the shoelaces out, but the thought came too late. That would be a MAJOR mistake. I started out with a REALLY dry mouth, and would spend the entire race trying to wet my mouth. Also, after tying and re-tying my shoes, only about 1/4 mile into the race, they both came untied. Ugh. 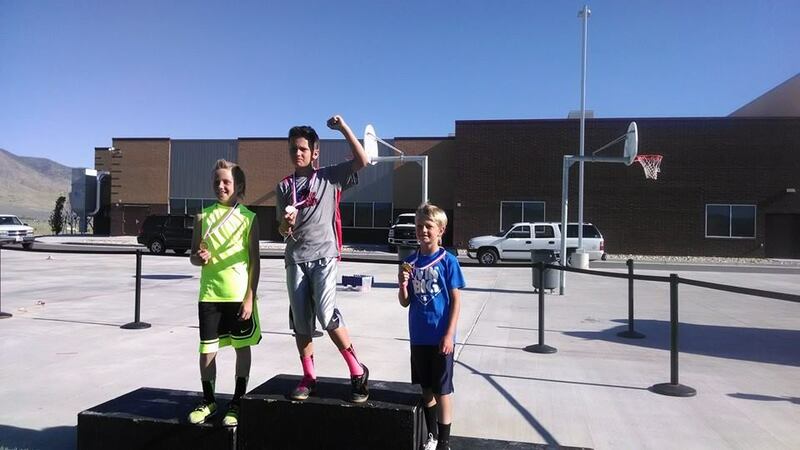 I was sitting in 2nd place overall behind a good friend of mine, Brandon Dase. When I stopped to tie my shoes, two men passed me. It took me about 1/2 a mile to catch back up to the two men, and right as I passed them, it happened again. There was no way I was going to run another two miles with untied shoes, so I sopped to tie them, and this time, I took longer to make sure they were tied TIGHT! The rest of the race was uneventful, and I felt great, going at a comfortable pace – which I forgot to look at my watch to see what pace I was running. It took me until a bout a 1/2 mile to go in the race, before I passed the first of the two men, and 1/4 mile before I passed the next one. I ended up with an 18:52, first place female and 2nd overall. I felt great, despite being bugged about my shoes and very thirsty. Right after, I did a small cool-down with Brandon, and then the kiddies arrived. They all looked so cute in their little running outfits and numbers. I was more excited for this than my race. My 4-year-old, Azure, wanted my husband to run with her, so I stayed at the finish with 8-month-old Axel, to cheer them all in. Anderson (10) was the first to come in, winning the race by 3-4 seconds. Ace (7) came in about 10 seconds later, then Aspen (8), Aussie (6), and Azure and Adam came in, holding hands and smiling. 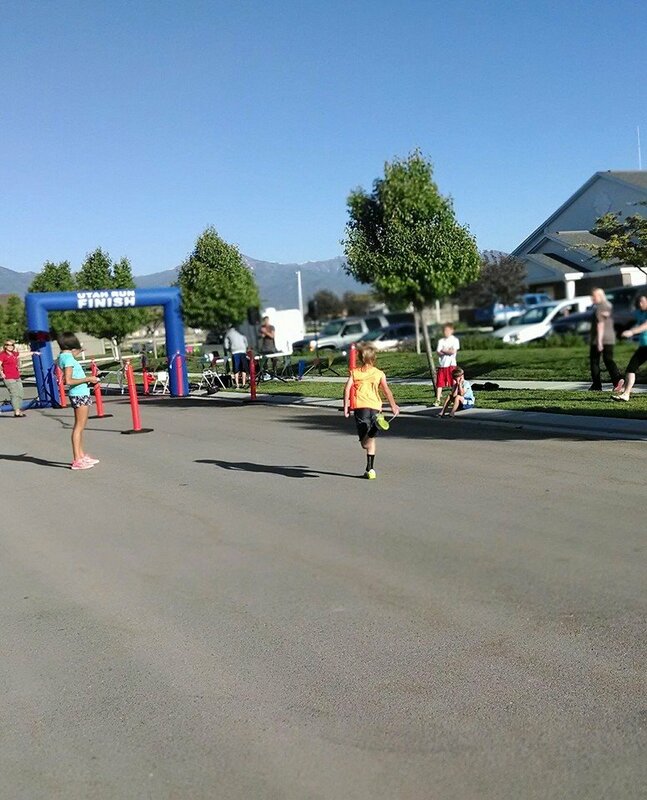 Here are some pics of the kids finishing. For some reason, my phone didn’t work when Ace finished, so I took a pic when we got home. Anderson won $5 and a free pizza, and I came home with $75. Minus costs, the Browns came home with $30 and a pizza. Not bad for a morning’s (not) work :). After, I ran a very warm 6 miles home … then walked 2 miles at a parade while pulling my Azure’s bike with her on it the whole way. I am one tired, happy momma :). 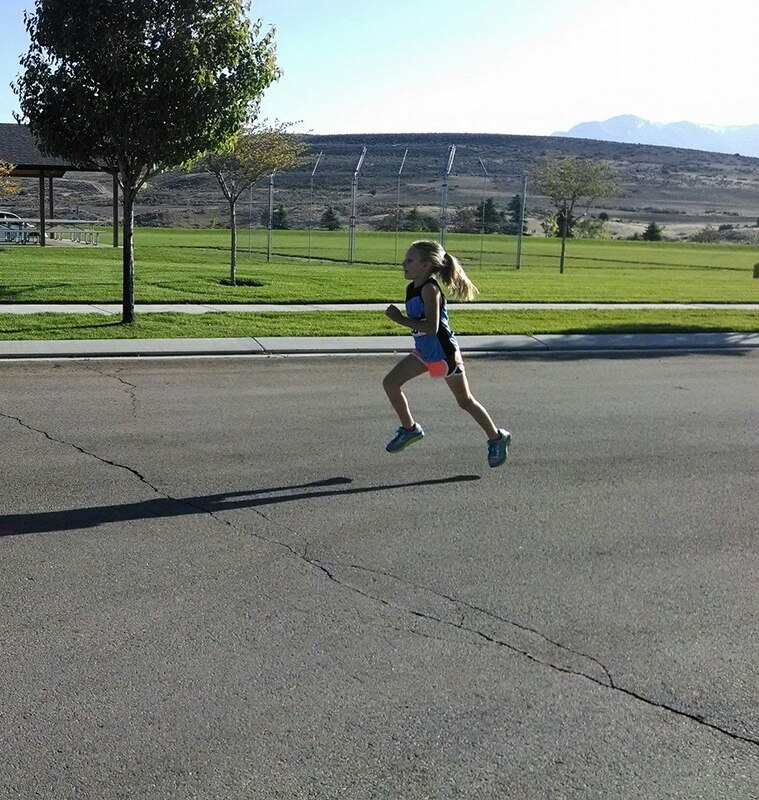 This entry was posted in exercise, family exercise, health, running, Uncategorized and tagged family fun run, hersheys track meet, Pony Express 5k, running. Bookmark the permalink.